Many of us wish to be the part of BSA (BuySellAds) publishers list. Many of us may have applied but got rejected. If that's the case with you, than the following tips would help you out for sure. 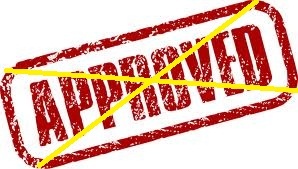 Do you think you have enough traffic for BuySellAds approval? Do you have enough social media fan base (Facebook + Twitter fans)? Is your page rank good enough? These are the questions that we don't want to face. Many people don't realize the importance of a professional look of a blog. If your blog is full of those flashy ads, with tons of popups etc than its time for you to stop dreaming of BuySellAds network. At present there are about 2800+ publishers at BSA directory and each and every blog speaks for its self. Their blog design looks mature and thus gives quite a bit of exposure to the advertisers. BSA application moderators have problem approving blogs that pay too much preference to advertisement. They like to see blogs coming up for the application that aims to provide quality to the readers and not just fill them up with ads all around. So make sure that you blog's design is clean while not overusing the ads. Applying here and there seems fancy to many. But a rejection letter feels worse. So make sure that you don't apply (even for the first time) when you are fully satisfied with your blog's standings. Though applying to BSA and getting rejected would not take away your chances to apply again but why not to be prepared for the exam before hand? The best way to prepare your self before hand for BuySellAds approval is to study the blogs that are already approved within their directory. 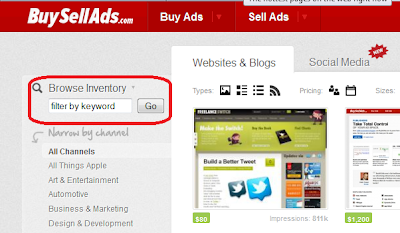 Search for your any relevant keywords (that defines your niche) in the BSA search bar. Say in my case, i would search for 'blogging tips'. It would show up couple of blogs (starting of with the one with most Traffic, impressions). As a reminder, impressions are basically the page views that your blog gets. Jump on to the last page so that you can get to know the statistics of the weakest blog in the directory for a particular keyword (that you typed in). So make sure that you blogs have 1-2 attributes of those blogs. Its not important to have the best Alexa rank out there for the approval. I have seen couple of blogs with Alexa rank around 200,000 but are listed in the directory. Plus they are making couple of dollars too (around 100$). Why? 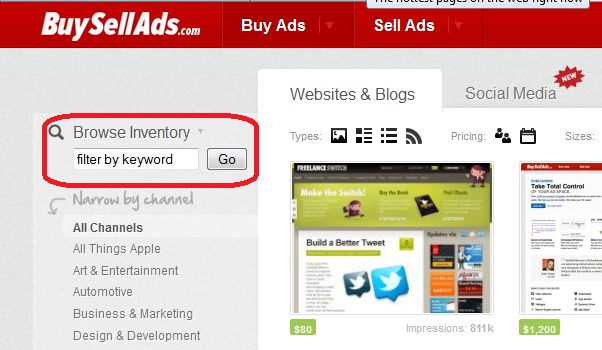 BuySellAds gives priority to the blog's social exposure too. If your blog got Facebook and Twitter followers above 1000, then i believe your blog can be a strong contender. Likewise, there are many blogs with a pretty low Alexa rank, but least social media following. BUT, even though you may get approved, the only major thing that would determine your capability to attract advertisers would be your blogs traffic. After all that's what the advertisers look for. More exposure to their sites/blogs. BSA don't accept free domain blogs. Pretty straight forward. You must own a custom domain name like (www.yourblogname.com). If you don't have enough Facebook and Twitter fans for your blogs backing, then it would get pretty hard for you to get accepted by BSA. Social media has started playing a vital role in making money online. Make sure that your blog has at least 500 Facebook and Twitter fans base. DON'T apply before that. The results might be demotivating. So thats all. Hope it would help you out your blogs standings. You now feel that you need a little more hard work for making your place into BSA publishers directory. I have referred couple of articles below that would help you out in the process. Now when you're done reading these articles out, you can read Case Study: 16 Reasons Why 'Darren Rowse' Is A ProBlogger? to know what do you lack as a blogger. You might need an extra push of motivation. You can read Arnold Schwarzenegger's 6 Motivational Advices For Bloggers .